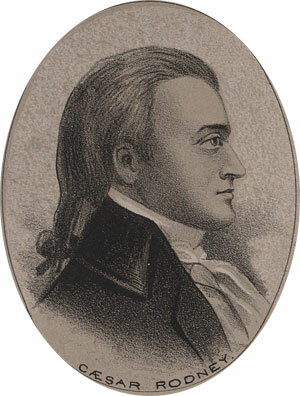 Caesar Rodney was born on his father’s farm near Dover, Delaware, in October of 1728. He was tutored by his parents and may have attended a local Parson’s school, but received no formal education. His father died when Caesar was 17. He was placed in the guardianship of Nicholas Ridgely who was a clerk of the peace in Kent county, and this seems to be the root of Rodney’s life in politics. In 1755, under the royal government, Rodney was commissioned High Sheriff of Kent County Delaware. This was quite a distinction for a man twenty-two years of age and he apparently honored the distinction, for in succeeding years his official capacities grew to include registrar of wills, recorder of deeds, clerk of the orphan’s court, and justice of the peace. At age thirty he attained his first elected office as a representative in the colonial legislature at Newcastle. He served in that position, reelected each year except 1771, until the legislature was dissolved in 1776-and then resumed the seat as a representative to the Upper House of the State of Delaware until 1784.